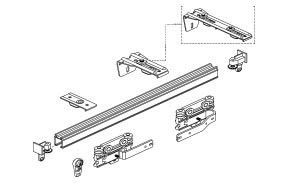 The Blind Designs Glide Top Fix Hand Drawn curtain track is an aluminium track with an extruded lip with pre-drilled holes every 400mm to ensure a quick and neat installation in Top Fix applications. It is available in white or anodised aluminium colours. An 8 wheel master carrier leads the runners, and can be drawn by hand or wand options. The ball bearing runners have a weight limit of 10kg per meter, and 14 are supplied per meter. 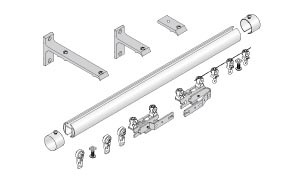 The Blind Designs Glide Hand Drawn curtain track is heavy duty white aluminium track with a small neat proﬁle, with steel brackets to suit Top Fix, Face Fix and Double Face Fix installation applications. An 8 wheel master carrier leads the runners, and can be drawn by hand or wand options. The ball bearing runners have a weight limit of 10kg per meter, and 14 are supplied per meter. We offer a variety of track bending options on this particular track. The Blind Designs Glide Cord Drawn track is a heavy duty white aluminium track, with white aluminium brackets to suit Top Fix and Single Face Fix installation applications. Operation is by a 4mm white cord which sits in a separate channel to the runners so as not to interfere with the operation. The cord extends out of the track on either left or right side, and is tensioned by an option of a pulley tensioner or a hanging weight. 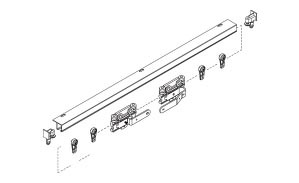 Blind Designs Glide Curtain Tracks are heavy duty, suitable for wide curtains and heavier weight curtain fabric. The advised weight limit for the fabric is 10kg per meter. The runner is a wheeled smooth running ball bearing runner, 14 are supplied per meter as standard. The Blind Designs Glide Avant curtain track has been designed to be exposed, featuring a variety of colours and a ﬂat fronted, rectangular proﬁle. Aluminium colour coded brackets are available to suit Top Fix, Face Fix and Double Face Fix installation applications. A master carrier leads the runners, and can be drawn by hand or wand options. The ball bearing runners have a weight limit of 10kg per meter, and 14 are supplied per meter. We offer a variety of track bending options on this particular track. The Blind Designs Glide Urban curtain track has been designed to be exposed, featuring a variety of colours supplied in a round proﬁle. 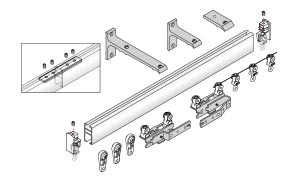 Aluminium colour coded brackets are available to suit Top Fix, Face Fix and Double Face Fix installation applications. A master carrier leads the runners, and can be drawn by hand or wand options. The ball bearing runners have a weight limit of 10kg per meter, and 14 are supplied per meter. 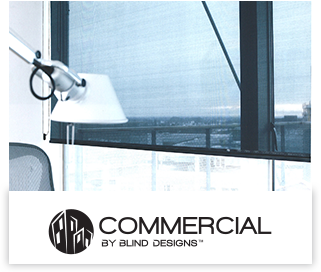 Blind Designs Glide Avant and Urban Tracks are designed with aesthetics in mind, and intended to be installed in exposed applications where the track itself is a feature and compliments the fabric of the curtain or the décor of the setting it is installed in. These tracks are regarded as heavy duty, suitable for wide curtains and heavier weight curtain fabric. The advised weight limit for the fabric is 10kg per meter. 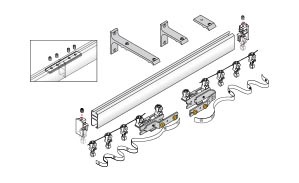 These tracks are available in Silver, Anthracite, Champagne and White, with coloured coded brackets to suit Top Fix, Face Fix and Double Face Fix installation applications.